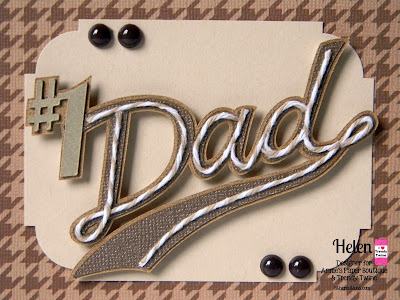 It's my turn to share again this month here on the Trendy Twine blog as we celebrate Dads! 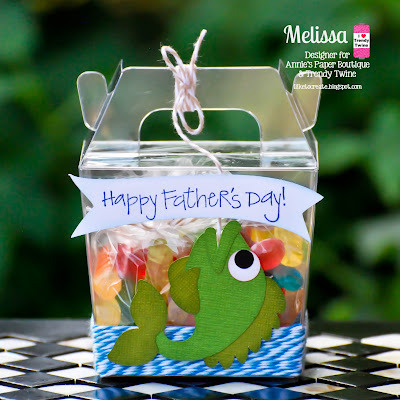 This is Melissa from M Miranda Creations and today I am using the Krazy for Kraft and Blue Berry Trendy Twine along with the Clear Take Out Boxes to make this super fun treat for Dad. I wrapped the Blue Berry twine around the box about 3/4" along the bottom to make my body of water and used the Krazy for Kraft twine as my fishing line attaching one end to my fish's mouth, threading it behind my banner and I tied it to the handle of my box to keep my fish from getting away. I filled the inside of the Clear Take Out Box with some yummy Gummy Worms. 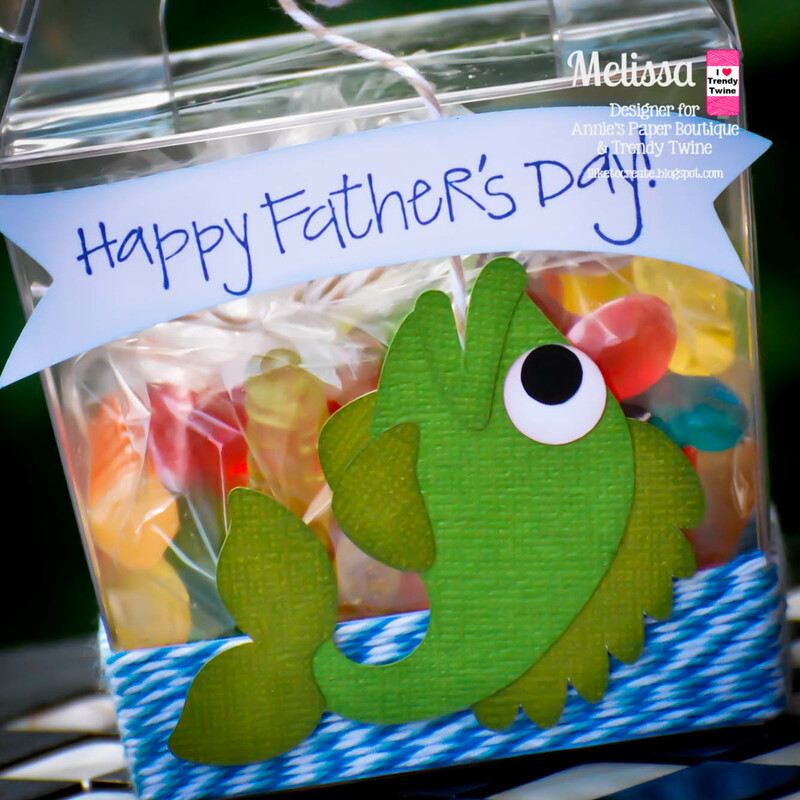 I hope you have been enjoying this month's Dad's Day inspiration as much as we have! 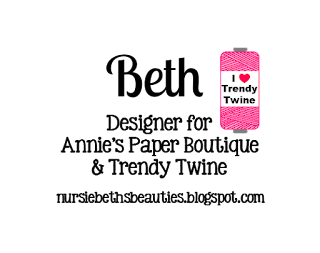 Stop by and visit us on Facebook as well both on the fan page and in our group, Twine It Up. 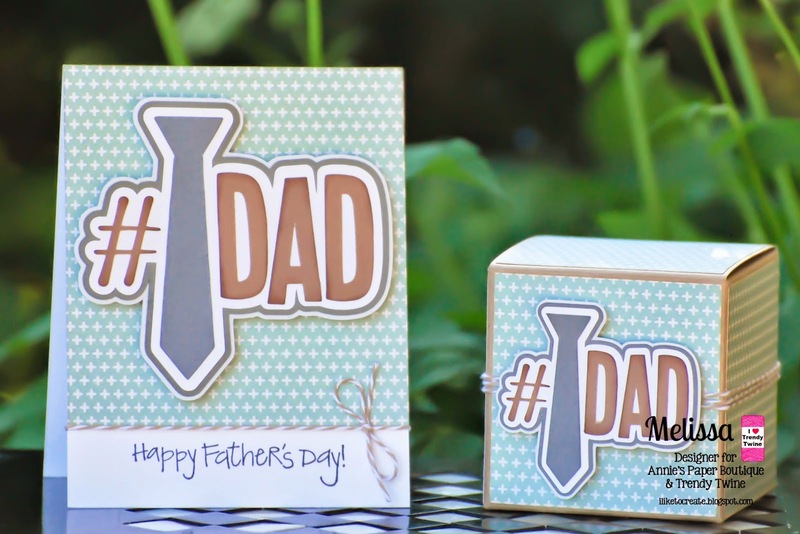 It's Tammy, and today I'm sharing a Father's Day card featuring Krazy for Kraft Trendy Twine. I started this card with a base of Medium Kraft Cardstock. I then adhered a piece of white cardstock to the base with foam adhesive. Next I took a strip of Medium Kraft Cardstock and punched a decorative border on one side. Over that I layed a piece of black cardstock which was the backdrop for the length of Krazy for Kraft Trendy Twine that I wrapped around the card face several times adhering with a Kraft Button and tied in a bow. 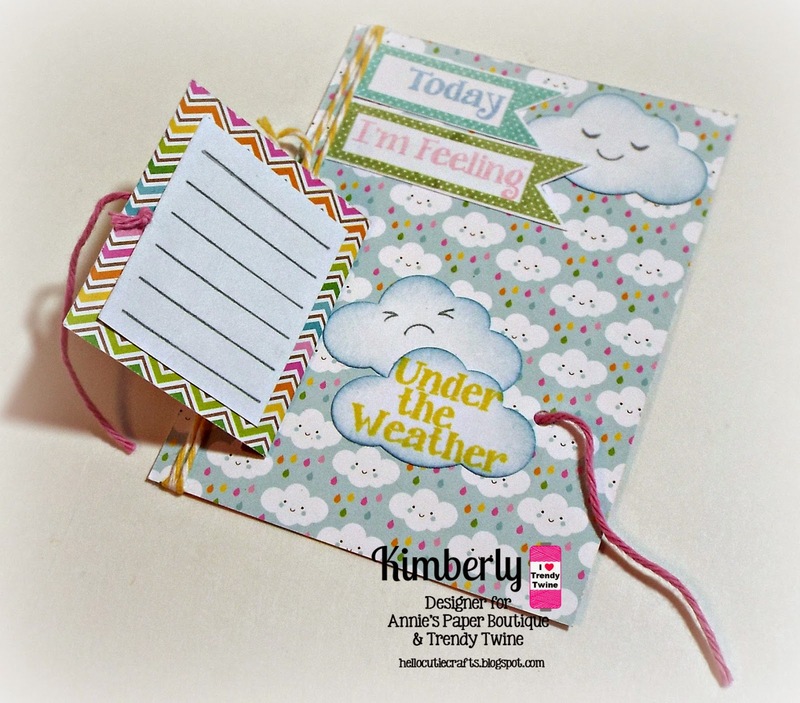 Using my scrap white cardstock, I die-cut some clouds and randomly placed them on the card. I stamped a hot air balloon on Lunch Bag Kraft cardstock with black ink and fussy cut adding to the white side of the card front. 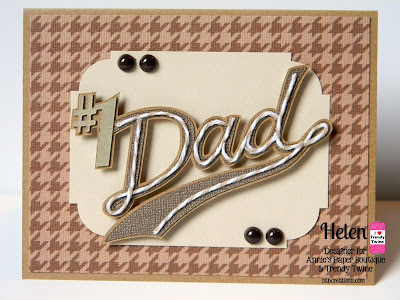 Lastly, I stamped Happy Father's Day on a white stitched banner and placed at the lower left side of the card front to complete the project. Be sure to stop by Annie's Paper Boutique to pick up Krazy for Kraft Trendy Twine today especially since it's on sale. Thank you for stopping by and have a Fabulous Friday! Hello everyone! I'm Helen from HTB Creations. 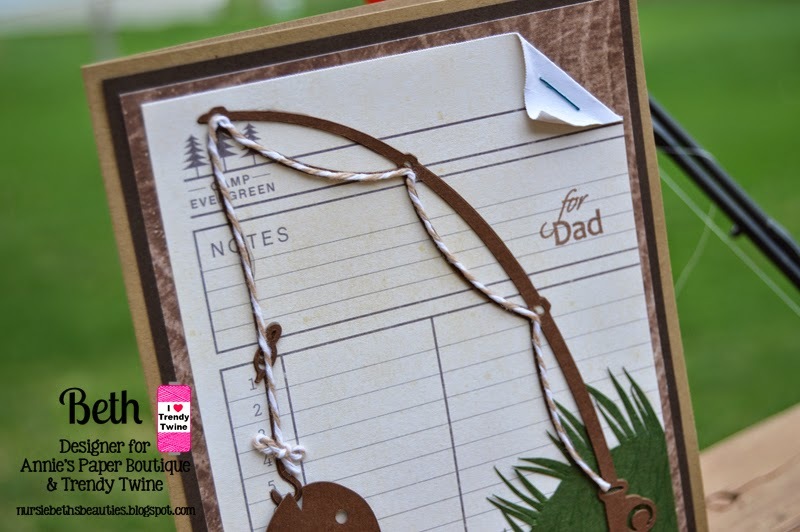 We are spotlighting the fabulous Krazy for Kraft Trendy Twine this month and featuring dads. I decided to make a Father's Day card for you today. I cut the phrase from a Cricut Cartridge and after layering, I glued my Krazy for Kraft Twine on the word dad. It goes a little slow, but I do like the way it looks. 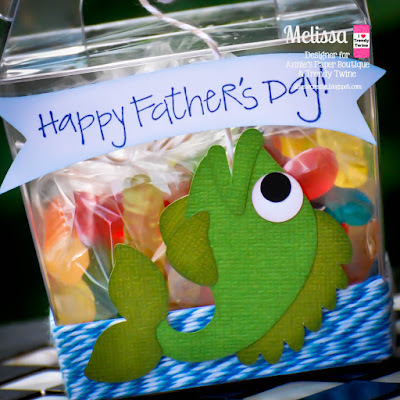 There's still some time in May, so be sure to stop back to see some more fun dad ideas--Father's day will be here before you know it! Beth from Beth's Beauties here. Today is a day that we remember all of those who have fought to give us all the freedoms that we have. So often we take them for granted. Today is a great reminder to be thankful for that. 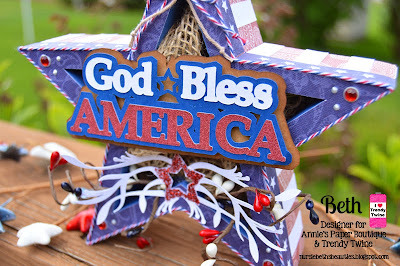 The project I have for you today is very patriotic to honor Memorial Day! The star is cut from SVG Attic's Uncle Sam's Party kit. I used The Paper Studio's Vintage Nation paper for it. 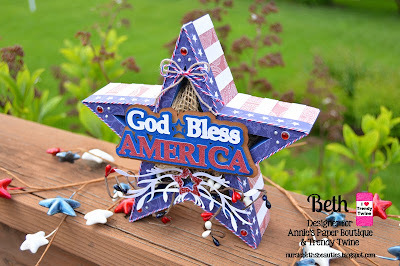 I added burlap in the middle of the star. 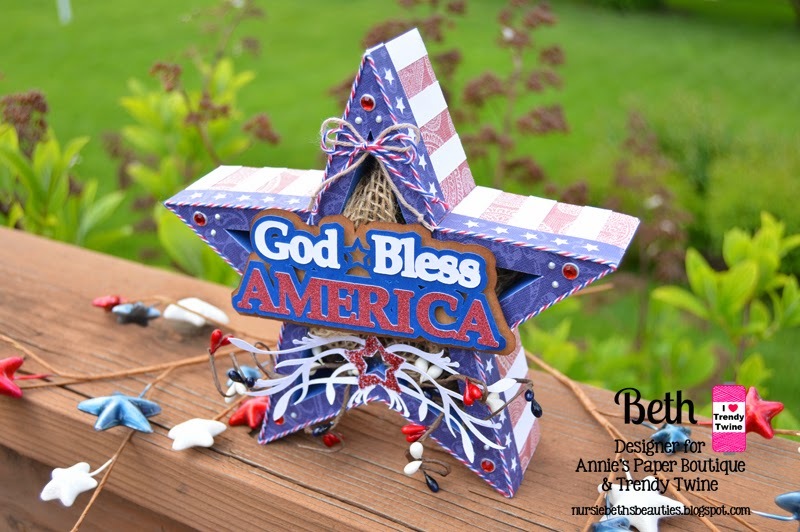 I went around the top edge of the star with Stars and Stripes Trendy Twine. 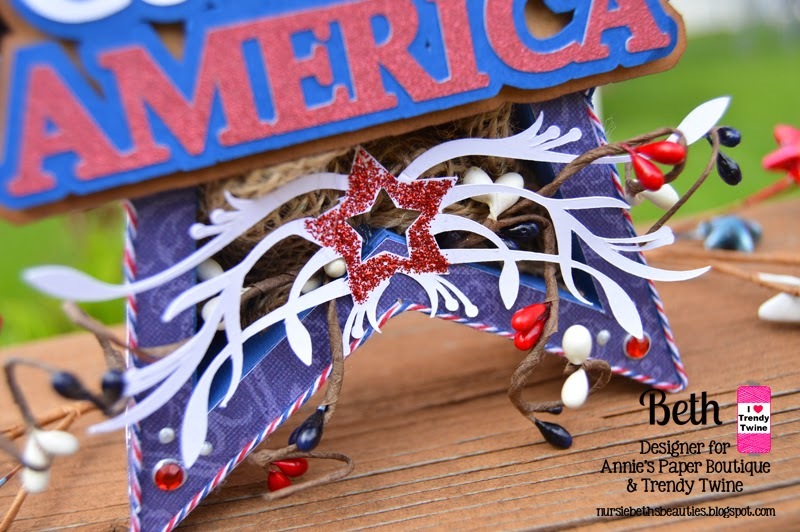 Then I added a bow at the top with Totally Kraft and Stars and Stripes Trendy Twines. The God Bless America and star flourish were cut from SVG Attic's American Eagle Wreath kit. I added some berry garland at the bottom of the star as well for a little something extra. This is a view of the stars and stripes along the entire outside of the star. 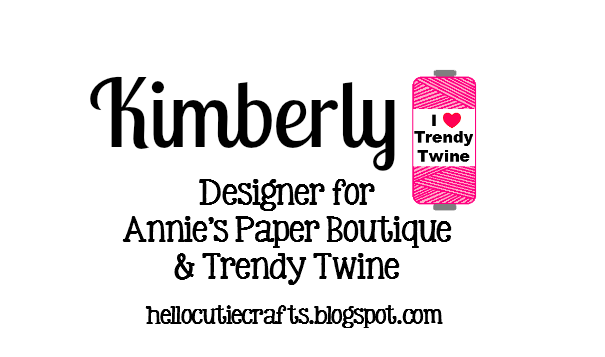 Happy Weekend Trendy Twiners!!!! So glad for a three day weekend. I hope you enjoy it!!! 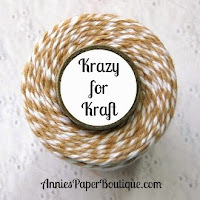 All of the Trendy Gals are counting down to Fathers' Day as we have been spotlighting the Krazy for Kraft Trendy Twine and 3x3x3 Kraft Boxes all month long making special projects for our very special dads. We hope you have been joining us! This is Melissa from M Miranda Creations and today I have this gift set to share with you. 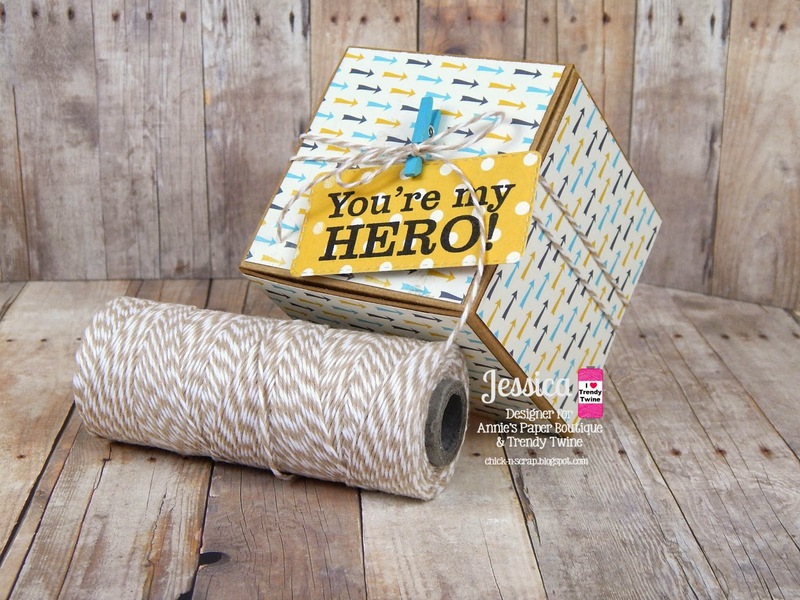 I have used both the twine and the Kraft Box. All the details on my supplies used can be found on my blog. Don't forget to join us on the Trendy Twine FB page and the FB Group Page called Twine It Up. Poor Lesley, you would think after three years of me hanging around, she would get tired and tell me to go away. Well, that must not be the case because she asked me, Becki of the Happy Card Factory, if I would showcase some of Annie's Paper Boutique stamps in different planners. Guess that means I will be rolling in and out a Friday or two this year. 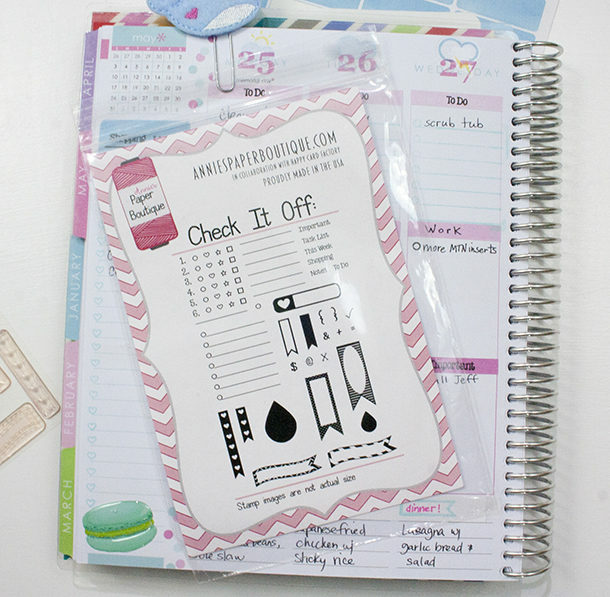 For May, I decided to start with the "Check It Off" set with my Erin Condren Life Planner. I wanted this set to springboard my "Planner Fridays" as I think it is the most versatile of all APB stamps. It is the best set to start with if don't own many stamps for your planner. Let me show you why. First off, let me say it is a bit nerve-wracking stamping in your planner for a post. I am not the most skilled stamper in the world or the best speller. So, if you mess up a certain date, you can't get a fresh sheet of paper as with making a card. Please excuse the white-out mess in the side panel. Apparently yogurt is a hard word for me to spell. :/ I debated leaving it and letting you all think I didn't pass 3rd-grade spelling or fixing it. I should have gone with the former. I figure you guys are used to that by now with me. Anyway....we shall proceed. 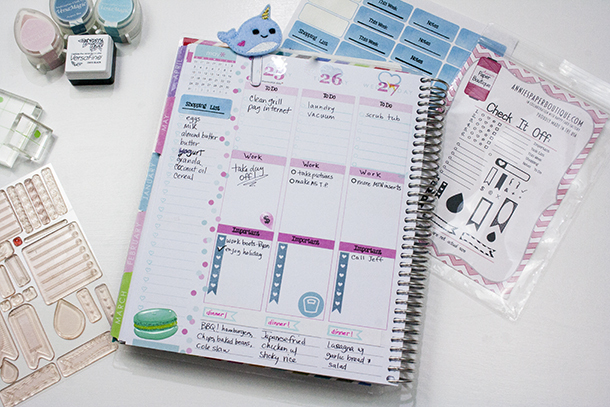 If the "Check It Off" set is the only planner stamps you have, you will still have organizing bliss. I use a part of it for every box in my Erin Condren. 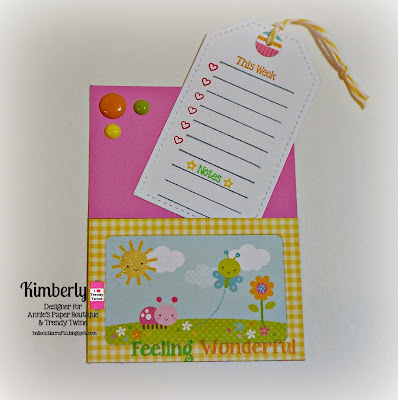 The dot/line combo was made with Erin Condren in mind. It is a perfect fit in the weekly boxes as shown here. Since the May theme is pink and pool, I used Sea Breeze chalk ink by VersaMagic. It's a little light, but love how it matches. 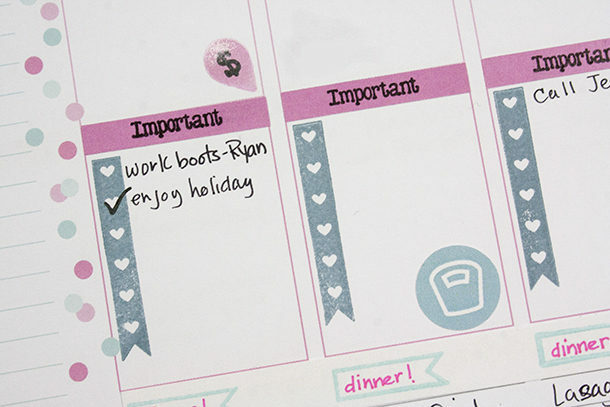 The dot/line stamp is great for making a to-do list. I have a problem. I love to write stuff down just so I can check it off. The set comes with a six headings. 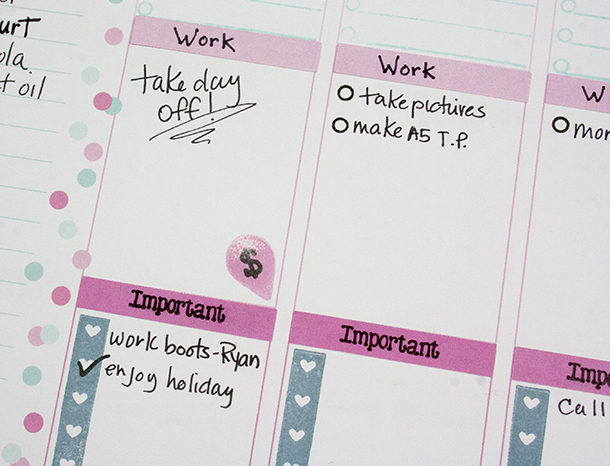 The "To Do" was used here on a blank sticker I made to cover up each heading that is in the weekly pages in the Erin Condren. The middle "day" box I always use for work-related plans. Since Monday is Memorial Day, I shall take the whole day off and do no work (yeah, right). Hey, it's in the planner, it has to happen! Monday also happens to be my payday. To mark it, I use the small teardrop in the corner and add the dollar sign. The bigger teardrop is used the same way, but to mark when my husband gets paid. He gets the big teardrop because his pay is much bigger than mine. The teardrops are cool because they can be used a lot of different ways. This is just one. Page flags seem to be all the rage in the planner community. That's why "Check It Off" comes with 8 different flag styles. I'm sure you can find a favorite! Like the heart checklist for my "important" section. This is a little different than my to-dos. 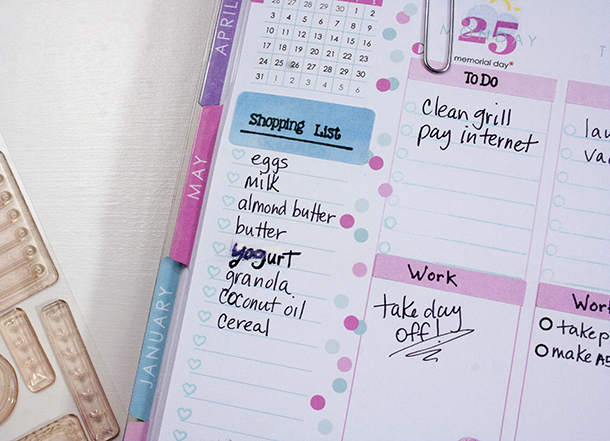 My to-dos are more of a chore list, whereas the important stuff goes down here. 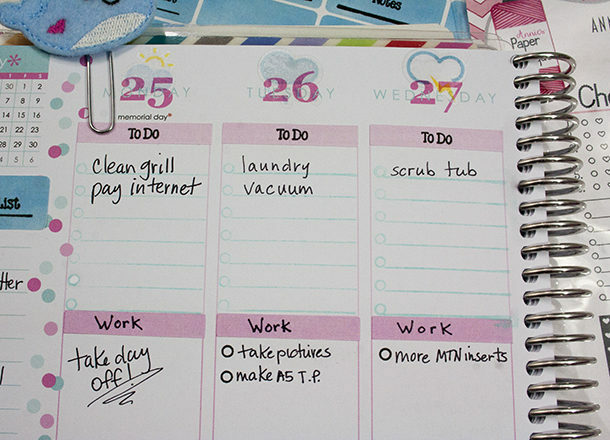 Things I really need to get done that day, that I try not to push off another day like laundry. Remember when I said that I like to check things off my list? Well, this set even comes with a cute little checkmark. I know I will enjoy the holiday, so I got that taken care of already. In order to make use of the bottom lined area, I cover up the ticker tape area with a blank sticker strip. That way I can use another one of the awesome banners. The small light banner is skinny enough to mark my dinner menu here. Then the lines at the bottom become really useful for my and my family. That don't ask, "What's for dinner?" anymore. They know to just check out my planner. Ugh, my dreaded white out. 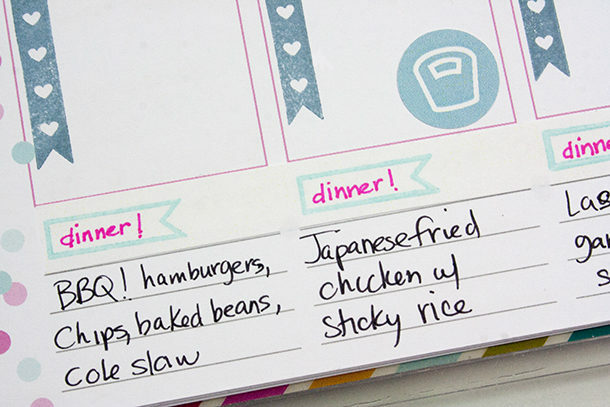 haha, As you can see, I use the "goals & notes" area to keep a running grocery list. That way there is no losing the list. My watercolor label is a nice size to cover up and change the use. Along with the sets "shopping" and "task list" stamp. I did mask out the "task", so I could just use the "list" part. While not specifically made to for the lines here, the heart checklist grouping fits pretty well. It's great because I get to check more stuff off. Are you seeing a reoccurring theme here? "Check it off" should be tattooed on my arm. This is only the tip of the iceberg when it comes to this great planner stamp set. Pick it up and see for yourself. I'm sure you guys can come up with lots of different uses and amazing ideas to be a better organized you. 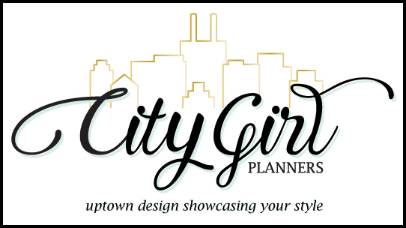 Thanks for stopping by and be sure to share your planner pages on Instagram. Don't forget to tag @HappyCardFactory and @TheTrendyGal. We'd love to see what your creations! Father's Day is coming up very soon and these 3x3 Kraft Boxes make the perfect box to add a special gift for dad! To make my project, I used designer paper from Carta Bella~Boy oh Boy and added panels to all 5 sides. Next I wrapped some Krazy for Kraft Trendy Twine 2 times around the box and added a fun matching clothes pin to hold it in place. 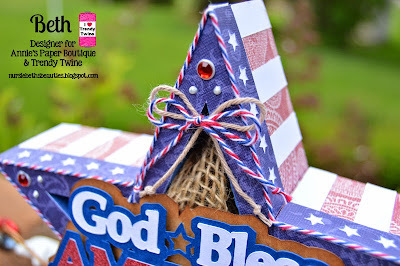 Using a die and stamp from My Creative Time, I made a sentiment tag and clipped it into the clothes pin. Tying off the twine with a simple bow around the clothes pin and my project is complete. Simple yes but perfect for any occasion~ don't you think??? Annie's Paper Boutique Planner stamps and some Trendy Twine. with the Check It Off stamp set. 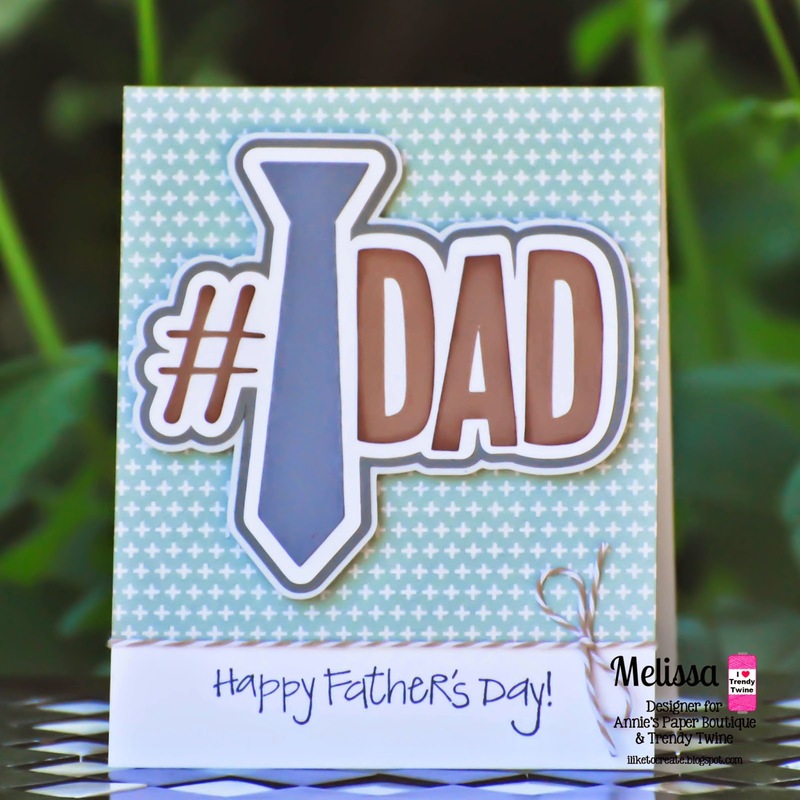 I stamped the smaller lines on a tag die cut then added the hearts twice. 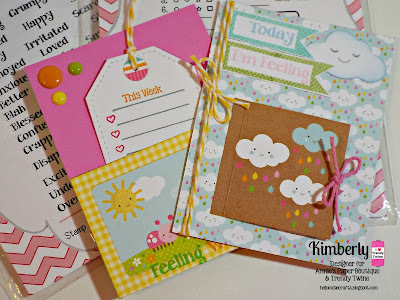 Then I stamped the "This Week", the "Notes" and stars from the same set. I added some Lemon Tart Trendy Twine to the top of my tag to finish it off. 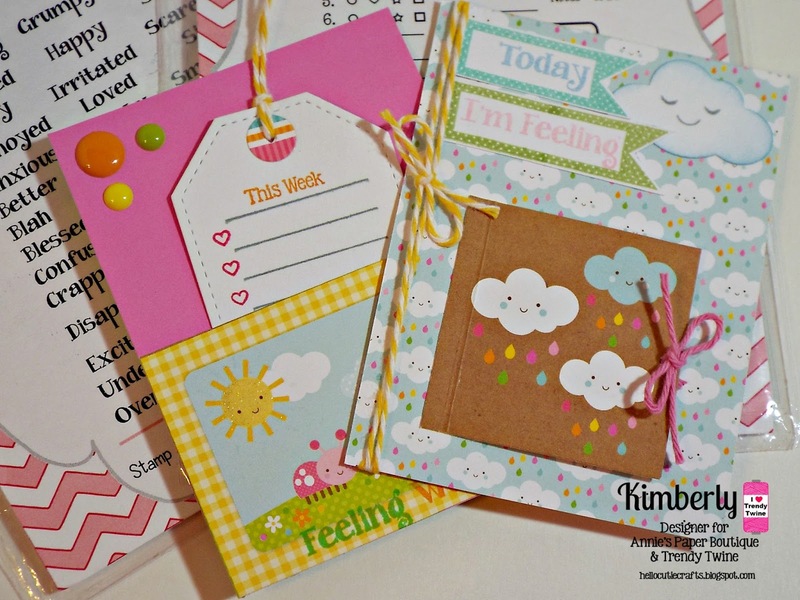 from Check It Off and a few words from Feeling Happy stamp sets. I extended the second banner by stamping it twice in order to fit the "I'm Feeling." and then added the "Under The Weather" from the Feeling Happy Stamp set. some Totally Pink Trendy Twine for the tie closure of the window. Make sure to check out all these supplies available in the store. Thanks for stopping by and for all the details please visit my blog. Hello everyone, it's Tammy with a treat box to share with you using one of the 3 x 3 Kraft Boxes which are on sale this month. I started by stamping my images directly on the 3 x 3 Kraft Box to decorate it. Next I added patterned paper to the top and a die-cut shape for visual interest. 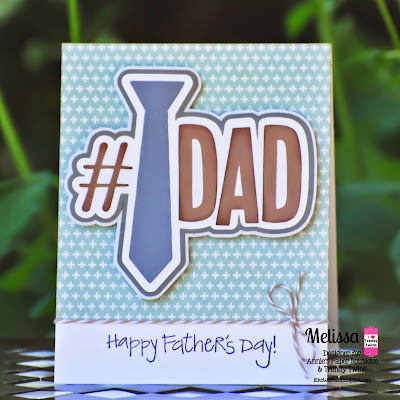 Using some fun masculine images in my stash, I stamped the faceplate, sentiment and hand in black ink on ivory textured cardstock and fussy cut it out to place on the front. Using some leftover scraps from decorating the top, I added a few banner tabs to stick behind the plate. 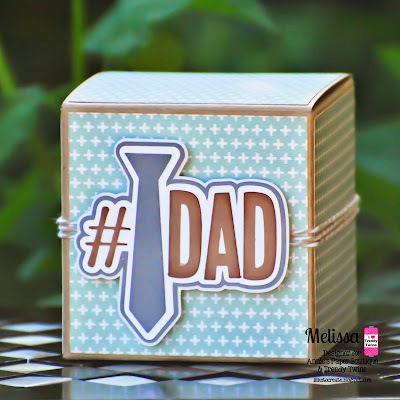 Using a die-cut made to lace ribbon through, I added Dad to the middle and wrapped a length of brown felt stitched ribbon around the box securing through the label bringing it up on both sides adding it to an aqua button designed as well to lace ribbon through. Now you have a secure way to open and close it. 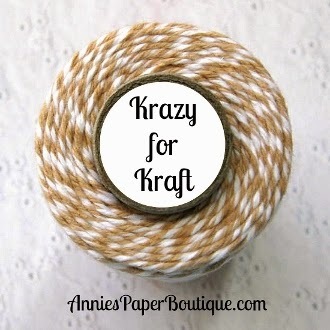 I then took Krazy for Kraft Baker's Twine to tie the tab closed. The recipient just has to undo the twine, pull the ribbon out of the button to get in the box. A cute and functional way to dress up your gift. 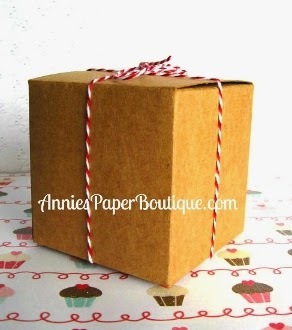 Be sure to stop by Annie's Paper Boutique to pick up these items today especially since they are on sale. Thank you for stopping by and have a good day! If you would like further details about the products used on my project, please stop by my blog: Creating Somewhere Under The Sun. Good morning! 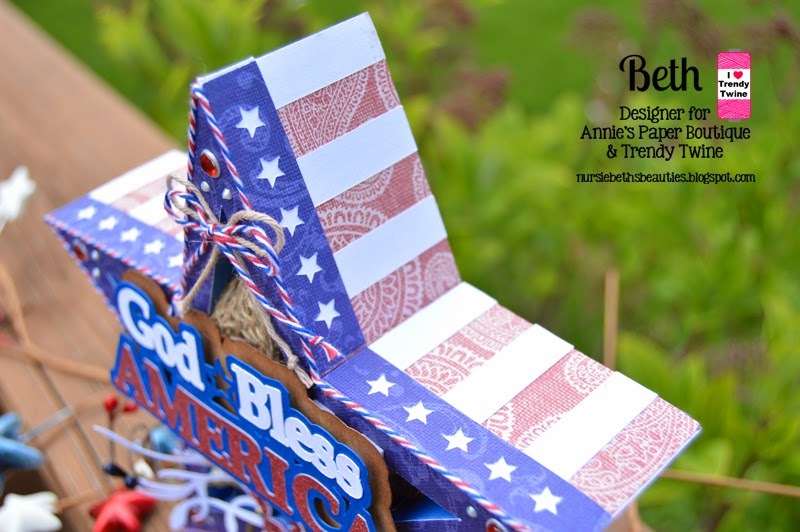 Beth from Beth's Beauties here to share a masculine themed card with you featuring the super versatile Krazy for Kraft Trendy Twine. It is on a great sale this month! 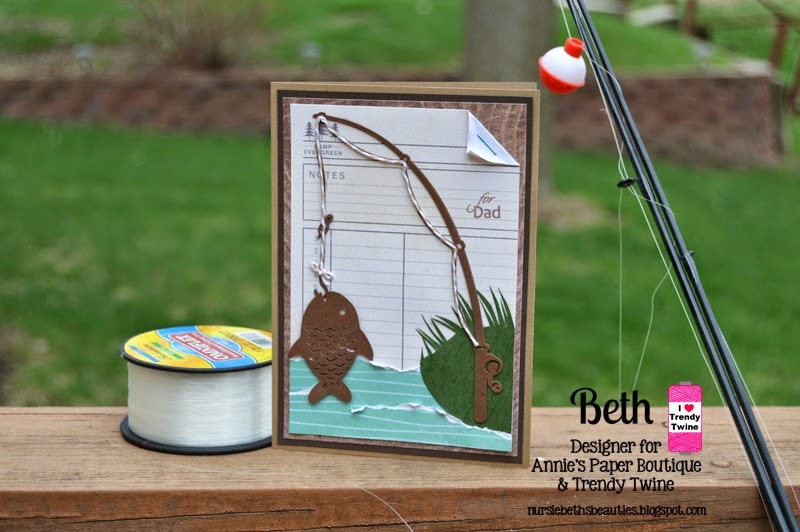 The Krazy for Kraft Trendy Twine was absolutely perfect for the fishing line on my card. 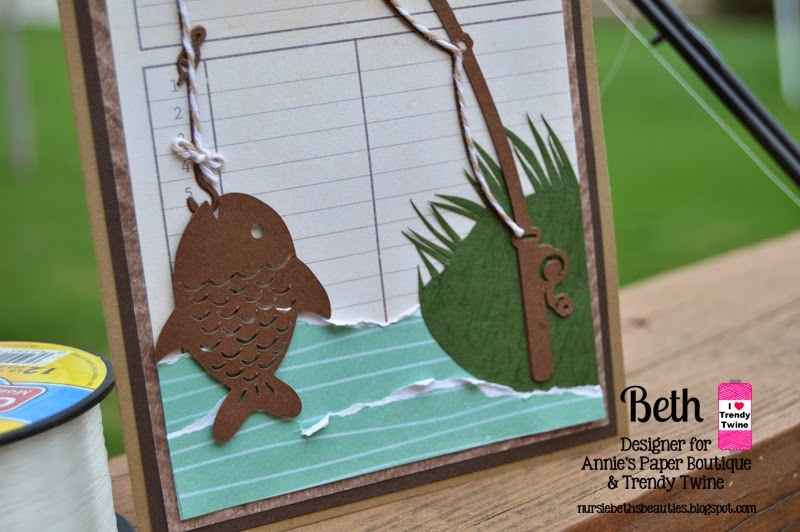 The fishing pole and fish were cutting files from the Silhouette store. 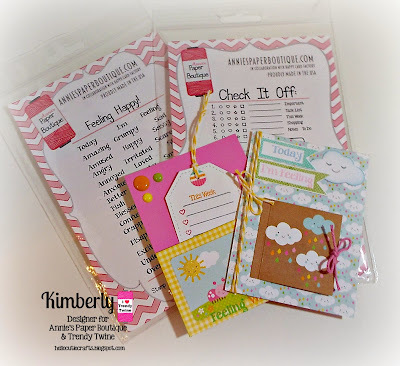 The patterned papers are from the Lakeside paper stack by Pebbles. I made the card look like a river bank scene. I cut the grass by hand, and for the water I just tore strips of paper and distressed it a bit.